A via ferrata is a mountain climbing route that has been modified with steel cables, ladders, bridges and other elements that make it fun and accessible for people without previous rock climbing experience. It’s like a cross between traditional rock climbing and a ropes course. Participants wear a harness and stay connected to a steel cable at all times. It’s based on a system that was developed in Italy during World War 1 to move troops safely through the rugged mountain terrain along the Austrian/ Italian Border, hence the Italian term “Via Ferrata” (Iron Path). In modern times it has become a very popular attraction for mountain adventurers across the Alps, just recently showing up in the US. What is the Tahoe Via Ferrata experience like? Tell us about the terrain. We are so lucky to finally have access to the spectacular terrain on Tram face. The Tahoe Via takes full advantage of the steep and exposed slope with its unique geologic features. Up to six people can travel together with a guide up the routes. Climbers gear up at the Alpenglow office in the Squaw Valley Village, then a quick ride in a 4×4 safari vehicle takes you to the start of the route, already 700′ above the Village. About 5 minutes into the technical climb you wrap around a steep corner to reveal the exposure and grand view of the Olympic Valley. You then have some different route options based on time and your group’s ability. Whichever route you take you will encounter steep ladders, bridges and interesting natural features like rock spires and old weathered trees. The longest routes ascend another 600′ feet of elevation topping out on the Tower1 Summit, then a pleasant hike brings you to the pickup site. A 3-4 hour adventure in total. What kind of person is the via ferrata for? The Tahoe Via experience is for everyone that enjoys being outside, hiking, good views and is feeling a little adventurous. Basically, almost everybody that visits Tahoe would enjoy the Tahoe Via. If you can climb a ladder, you can climb the Tahoe Via. Tell us about your guiding experience. What’s it like being an Alpenglow guide? Where has your climbing taken you? I’ve been climbing all my life and it’s brought me to countless beautiful places around the world. 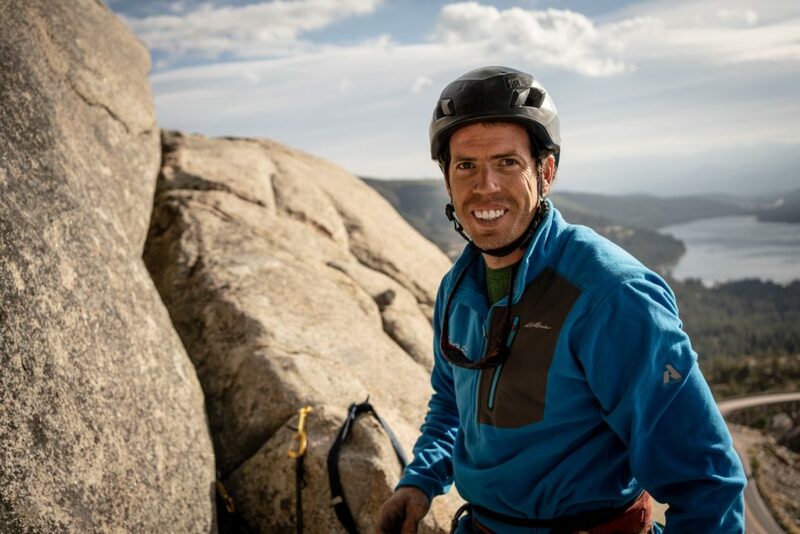 I love sharing the stoke and guiding people on rock climbing adventures, its a super rewarding job! I really like working for Alpenglow Expeditions. 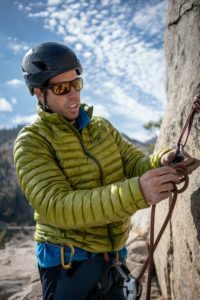 I mostly guide local rock climbing and Via, but I like to know that clients have access to a full range of mountain travel opportunities with Alpenglow, like ski mountaineering and high altitude alpine climbing. It’s nice to be a part of a team that could potentially guide a client on a path from the Via to skiing off an 8,000-meter peak and everything in between. Have you climbed other via ferrata? I have climbed quite a few Via Ferratas around Europe; in Italy, France, Switzerland and Spain. Including a route in the Dolomites that traversed behind waterfalls. Mostly squeezing them in between rock climbing days for me but Its common to see people traveling around the alps just for the via ferratas. Sometimes on well designed multi-day routes, sleeping in mountain huts along the way. Can via ferrata be a good first step to learning to rock climb? It’s a great first step. I think the Tahoe Via is going to spark a lot of interest in rock climbing. I’ve already seen it in my clients. On the Via, you clip into the cable while you’re still walking on the trail, then you eventually transition into climbing up vertical rock. It’s a pleasant way to realize you’re not as afraid of heights as you thought. At some point on the route you’ll get into a flow, moving your body through the terrain, breathing the mountain air, watching the valley views expand, and enjoying time with friends. You’ll get a taste of the joy of mountain climbing and chances are you’ll want more. For more information on Via Ferrata, or any of our other expeditions check out our website. For any questions call our office at 877-873-5376 or send us an email info@alpenglowexpeditions.com. We hope to climb with you soon!